Meaning “Let us walk in the light”, this sentence is taken from Isaiah 2:5. The “light” implies the light of the Lord. The cross represents Mr. Ralph’s Christian faith, the trillium his home province of Ontario, and the sun is taken from the flag of the Philippines, the birthplace of his wife, Dr. Vivian Ligo. The wolf is a Canadian animal associated with pathfinding and bravery. The sun on its shoulder repeats the reference made to Dr. Ligo in the arms and makes an allusion to the motto. The scroll refers to Mr. Ralph’s background as a lawyer and managing director of a business consulting firm, as well as to Dr. Ligo’s academic achievements. 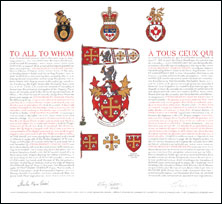 The announcement of the Letters Patent was made on November 22, 2008, in Volume 142, page 2984 of the Canada Gazette. 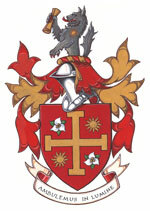 Original concept by Bruce Patterson, Saint-Laurent Herald, assisted by the heralds of the Canadian Heraldic Authority.